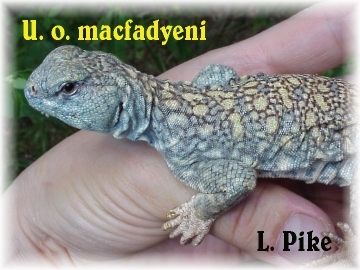 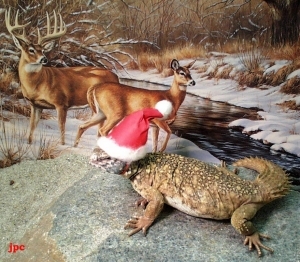 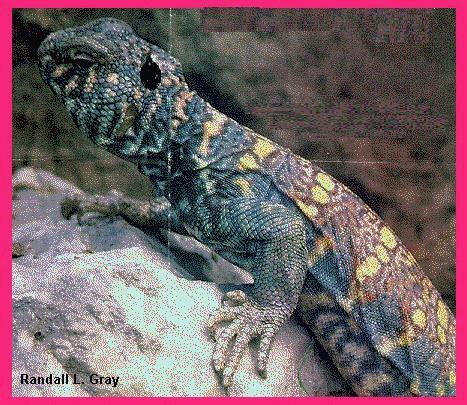 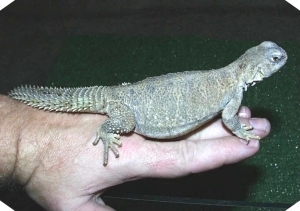 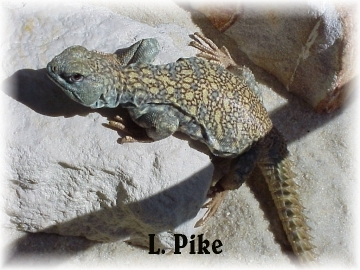 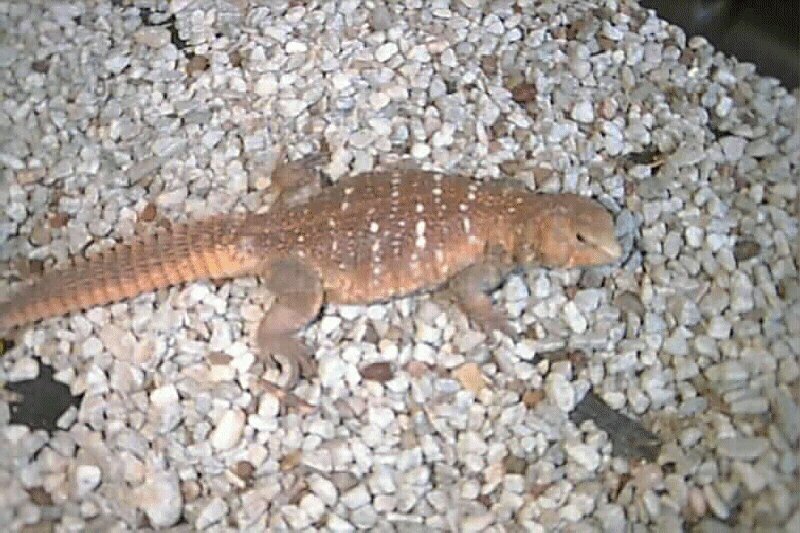 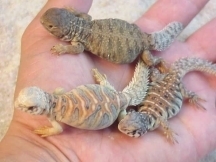 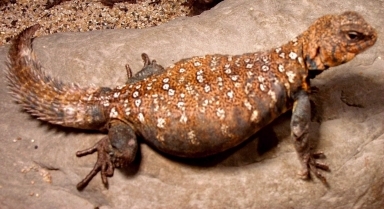 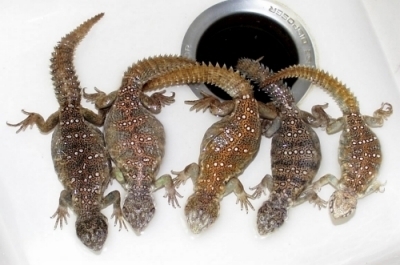 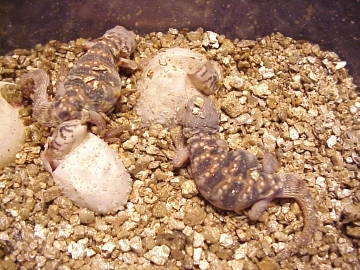 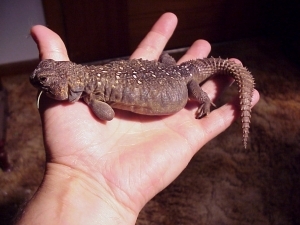 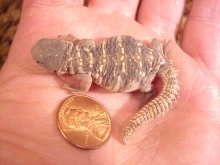 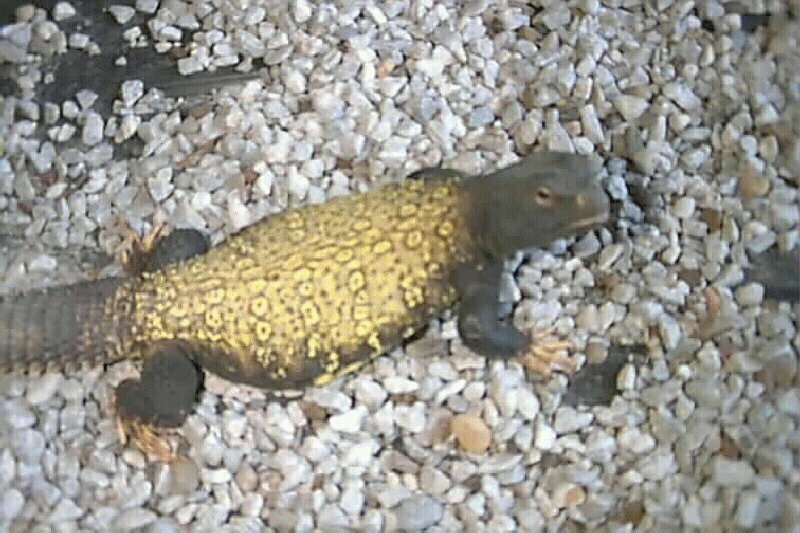 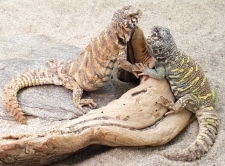 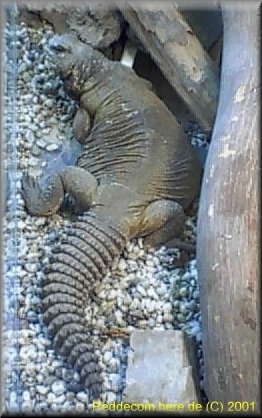 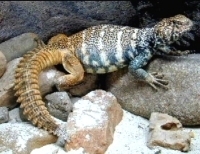 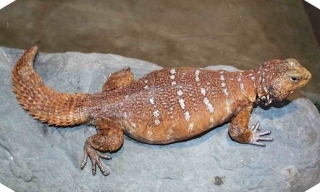 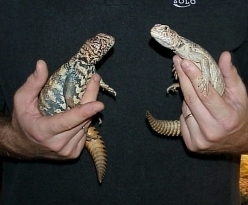 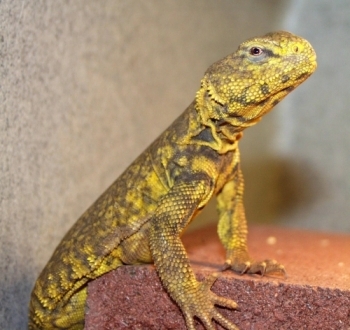 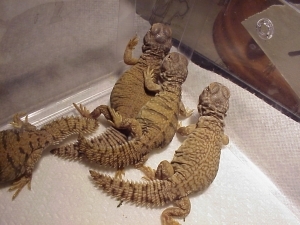 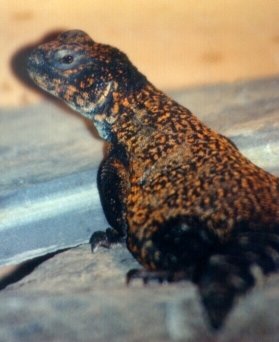 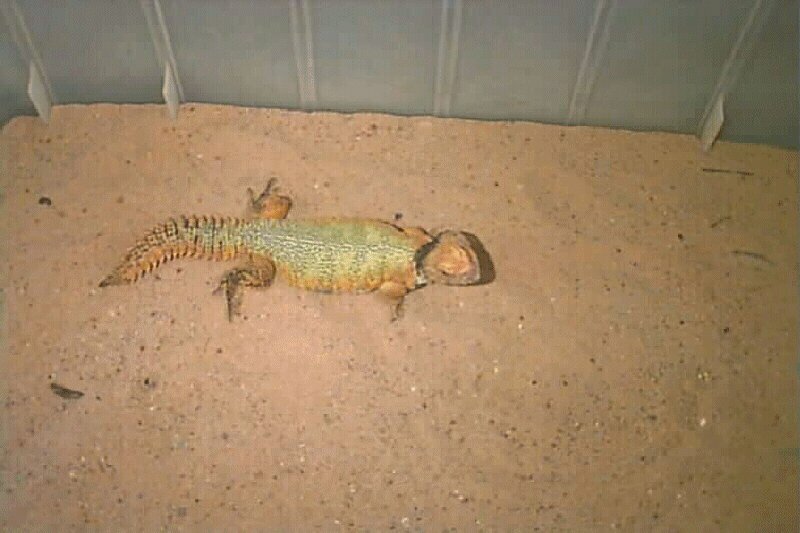 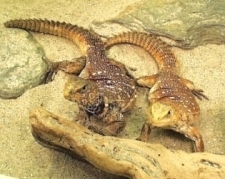 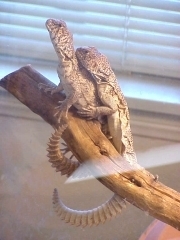 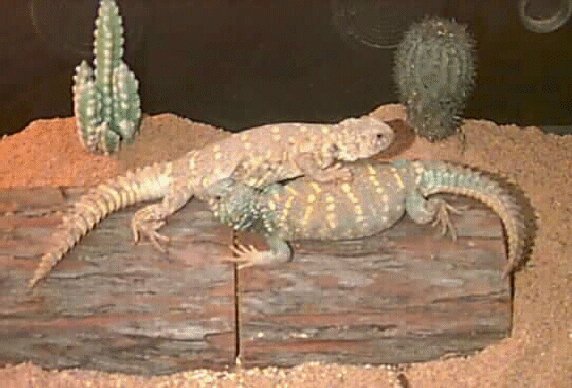 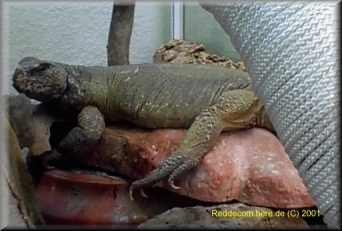 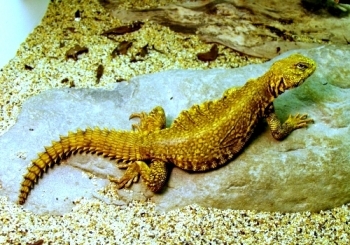 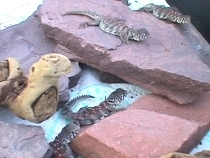 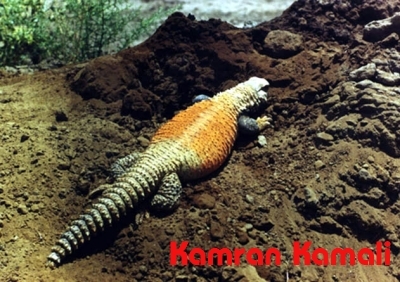 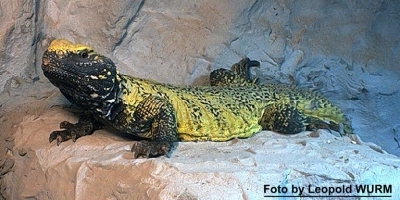 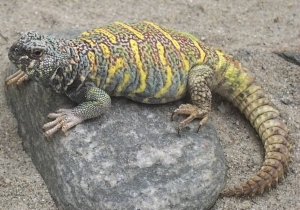 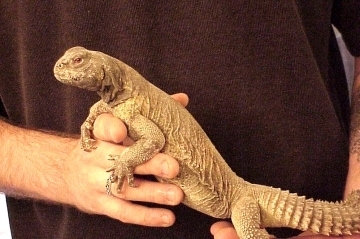 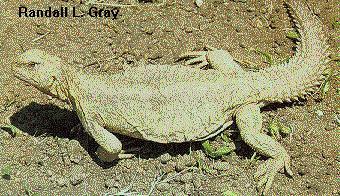 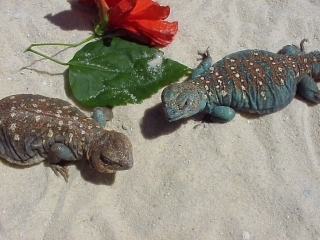 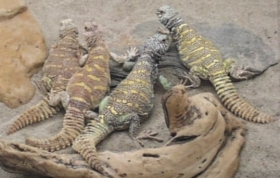 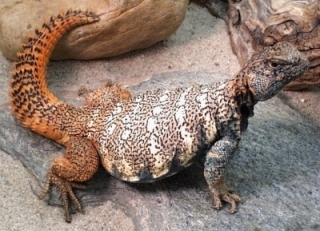 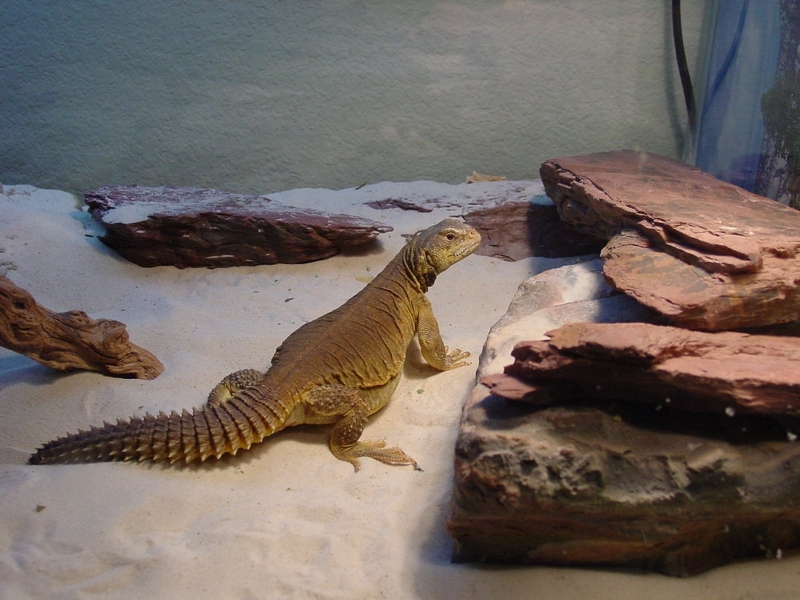 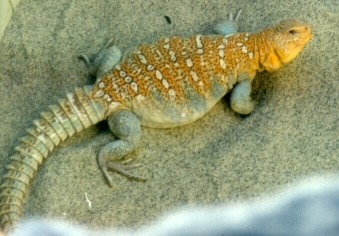 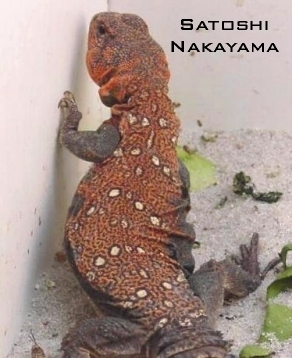 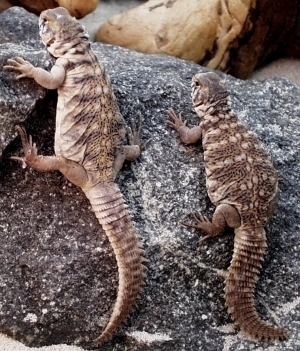 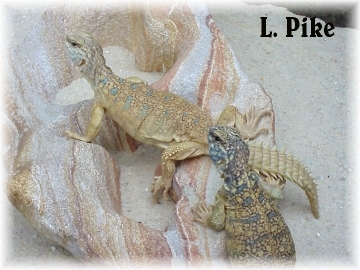 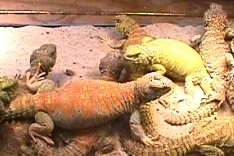 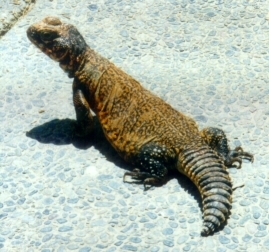 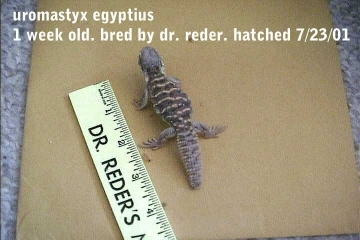 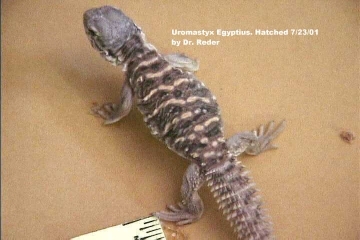 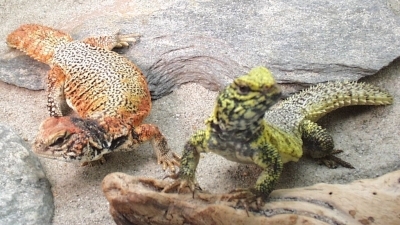 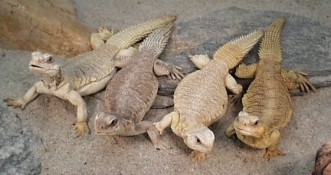 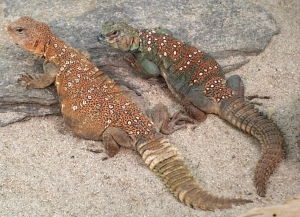 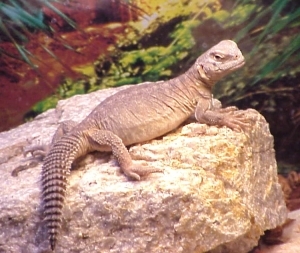 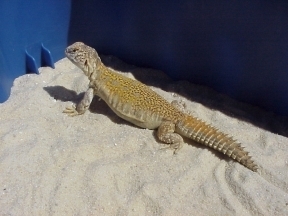 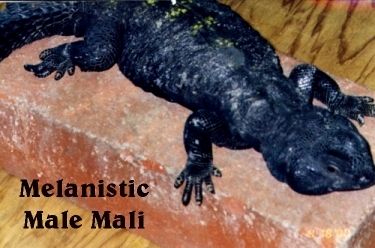 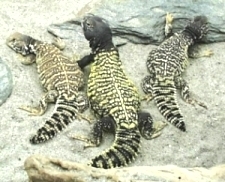 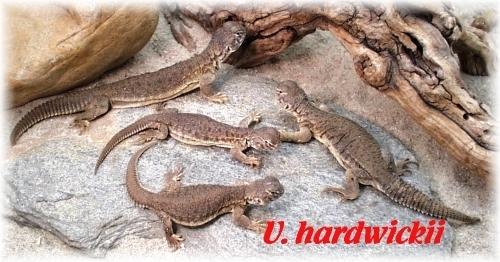 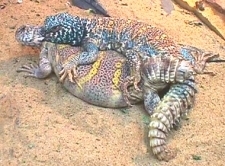 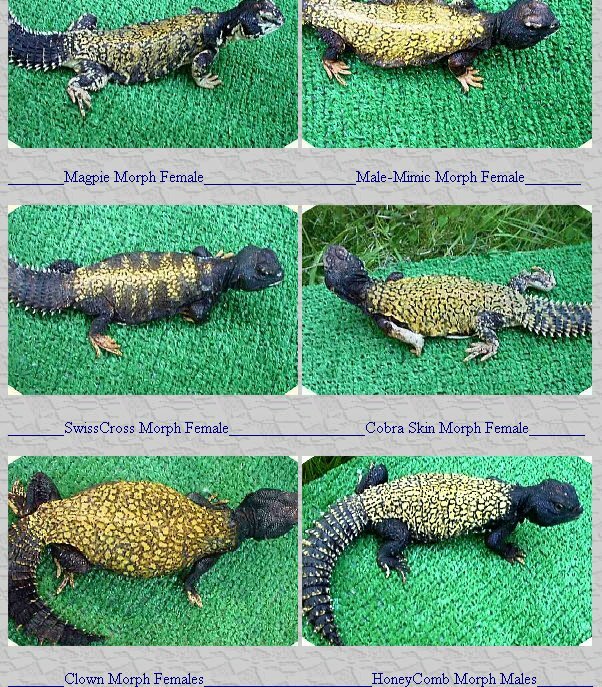 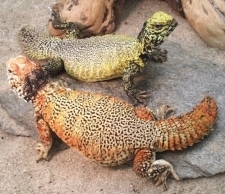 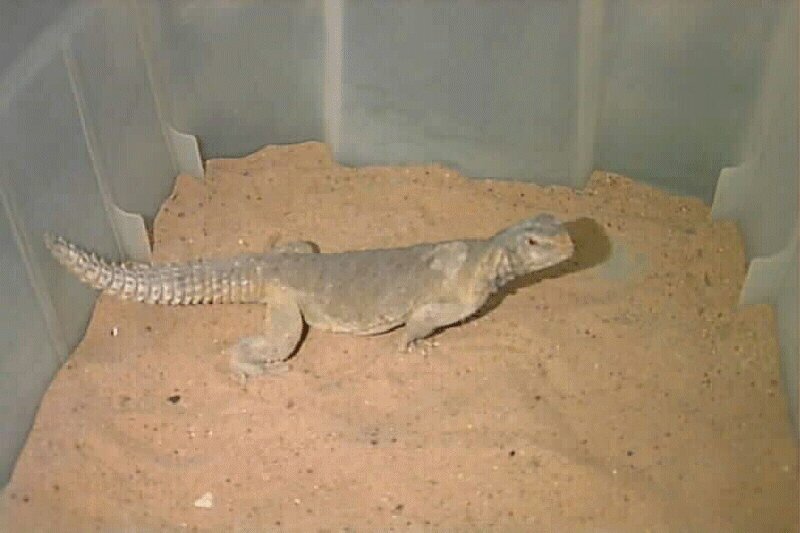 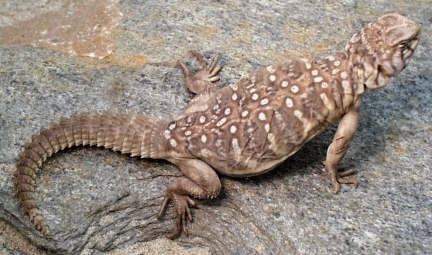 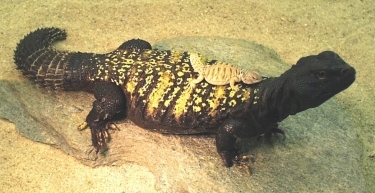 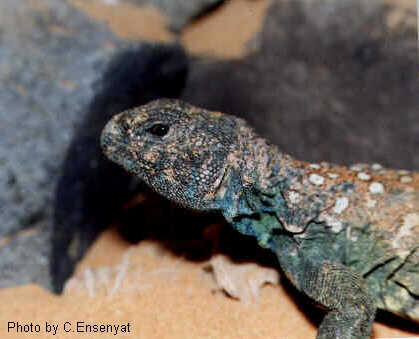 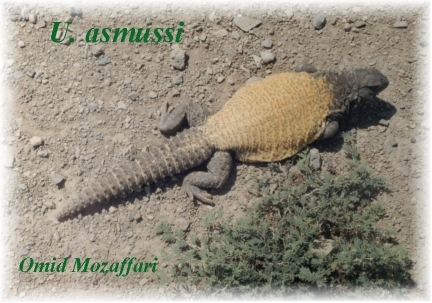 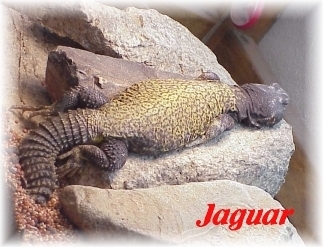 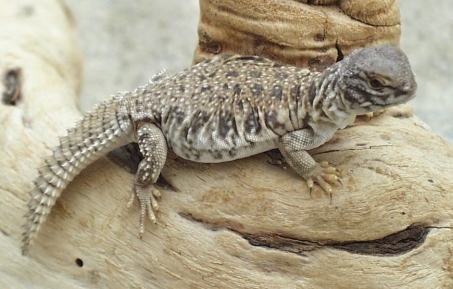 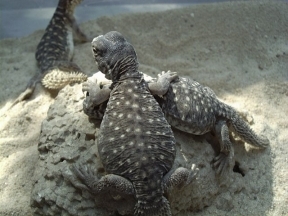 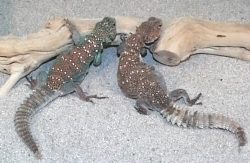 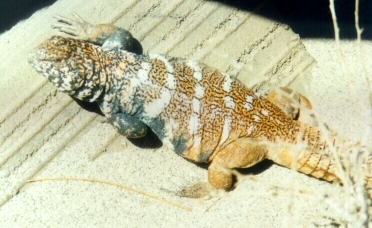 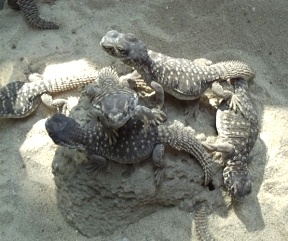 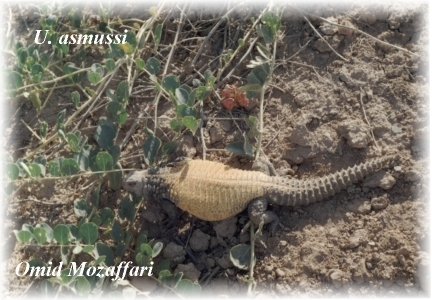 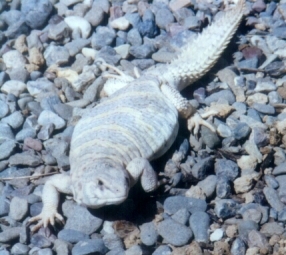 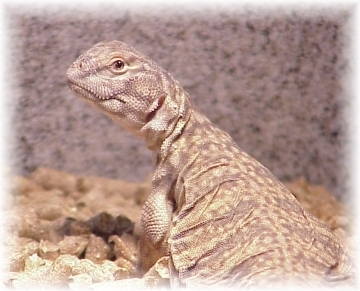 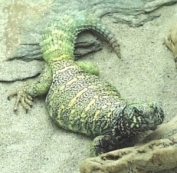 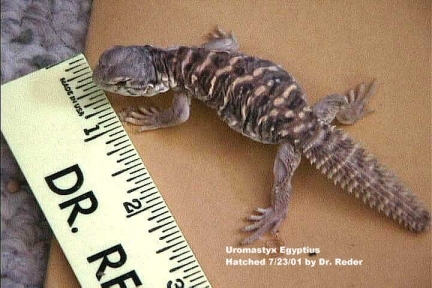 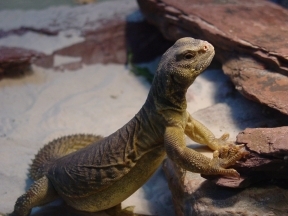 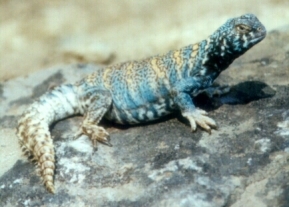 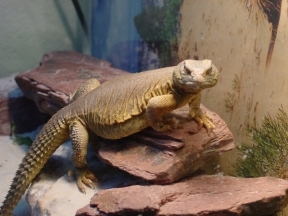 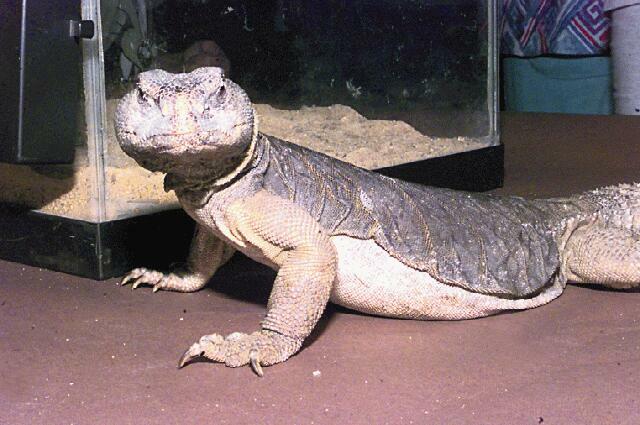 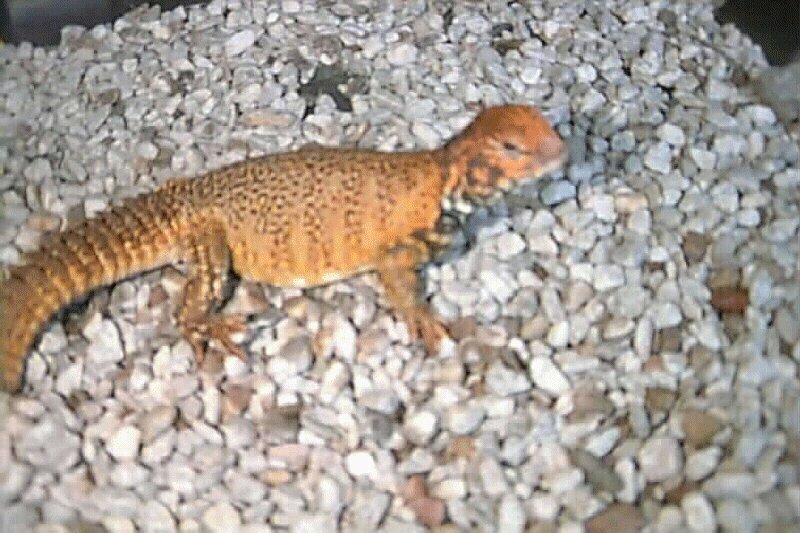 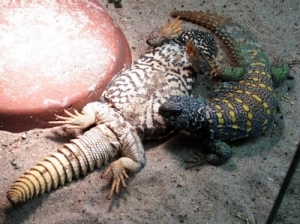 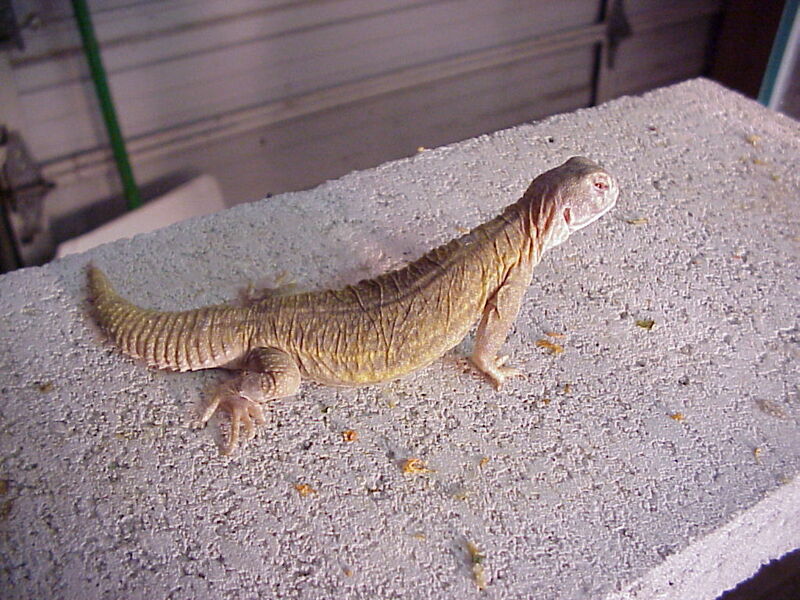 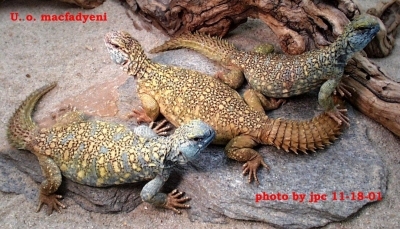 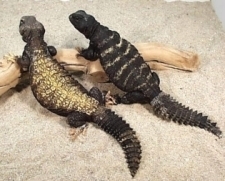 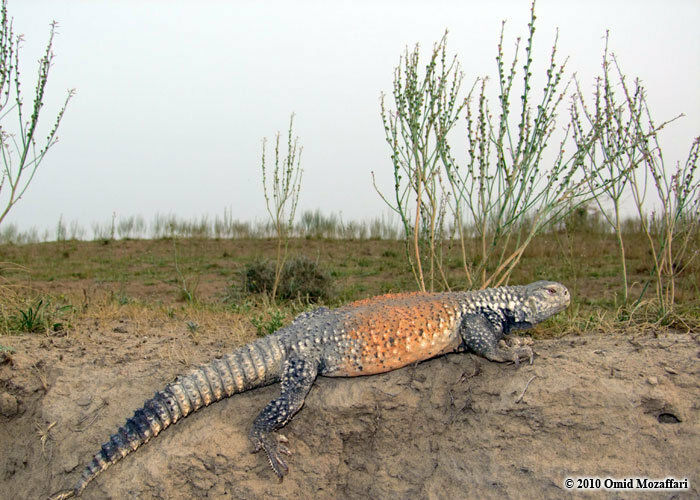 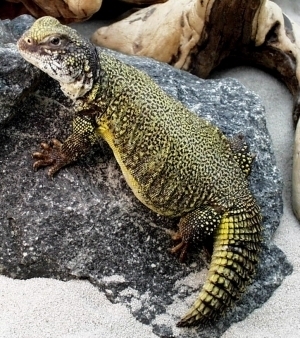 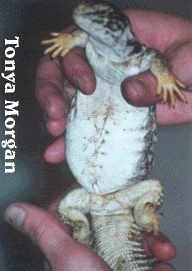 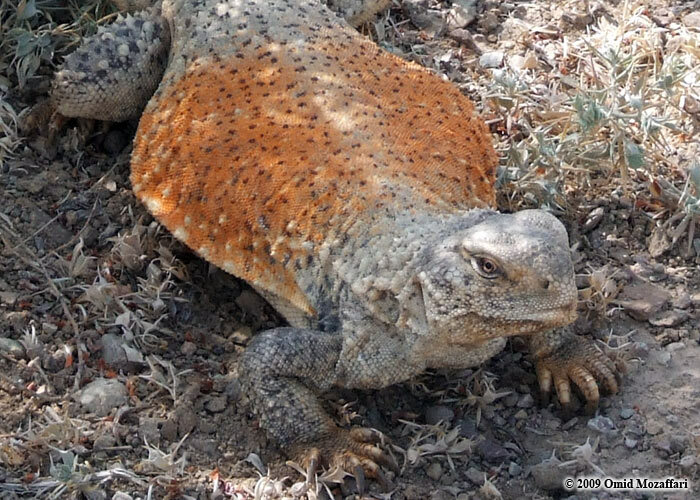 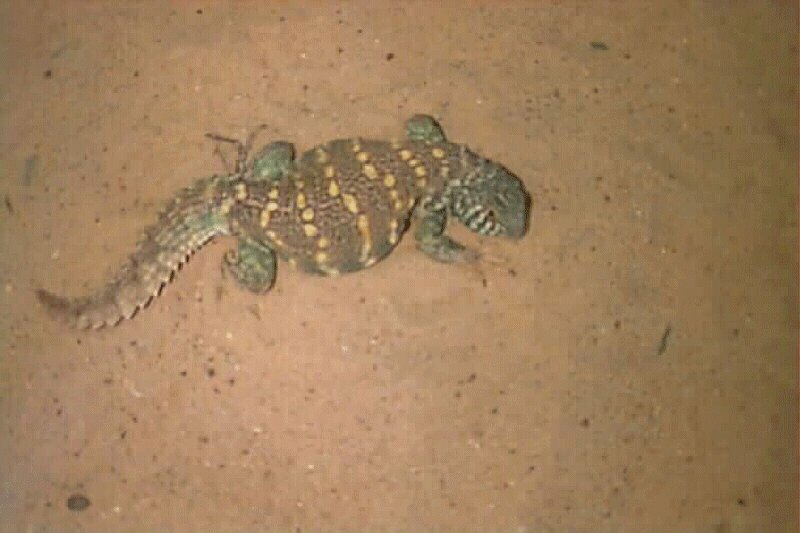 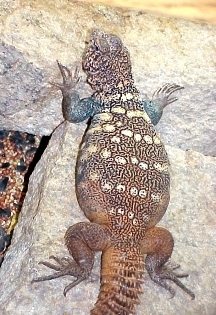 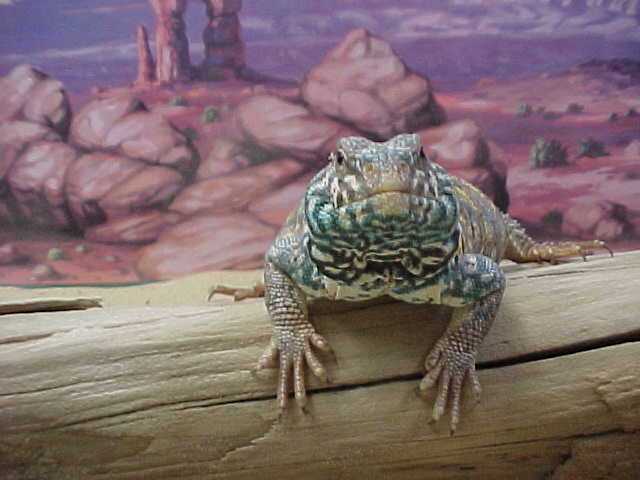 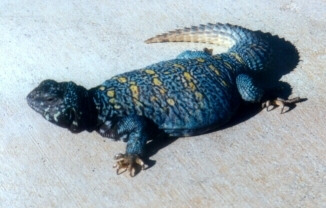 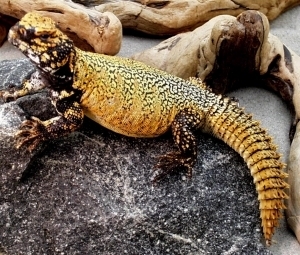 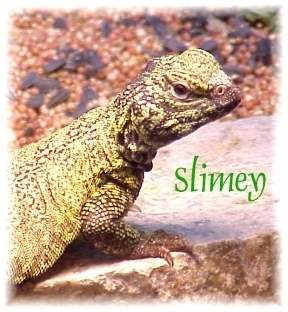 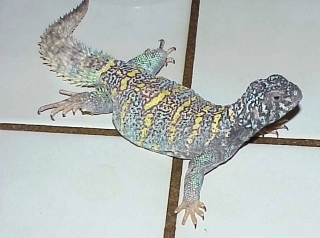 Uromastyx Pictures and Enclosure Images Photo: Lindsay Pike, top to bottom: U. maliensis, U. o. ornatus, U. benti (lowland) To submit pictures (in .jpg format) of your animal(s) or enclosure(s), click here. 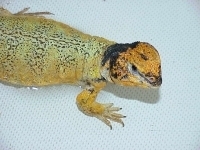 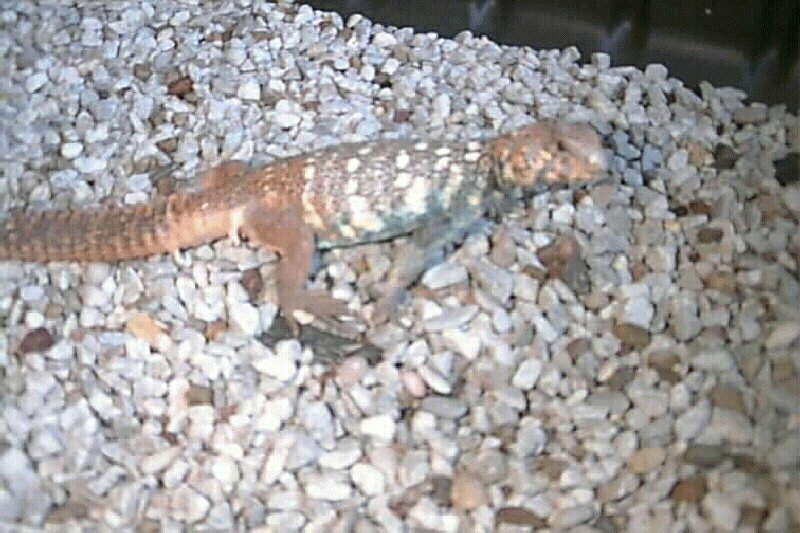 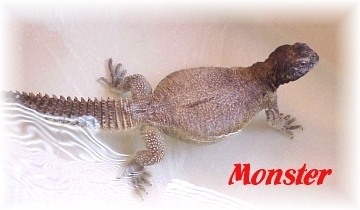 female microlepis juvenile DougDix, Ph.D.
High orange adult male lowland form Douglas E. Dix, Ph.D.
Yellow male adult head shot Doug Dix Ph.D.
Yellow male adult full body Doug Dix Ph.D.
Orange male adult NICE!! 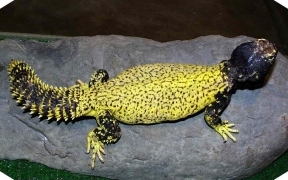 Doug Dix Ph.D.
Neon-yellow male Awesome! 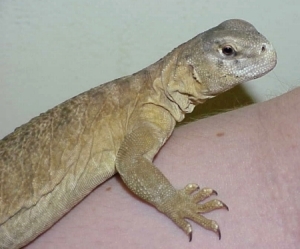 Douglas E. Dix, Ph.D. 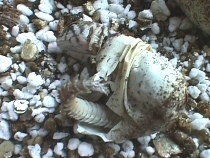 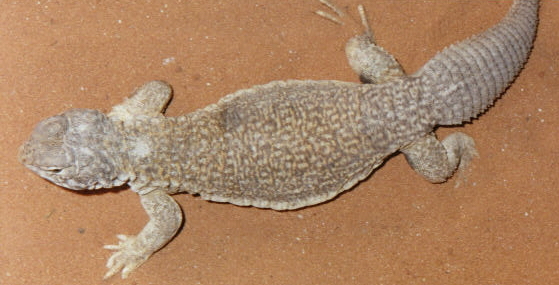 Adult male-mimic females Douglas E. Dix, Ph.D. 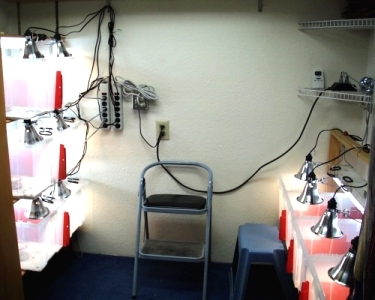 Troy Jones Uro room takes up one room of his 3 bedroom home. 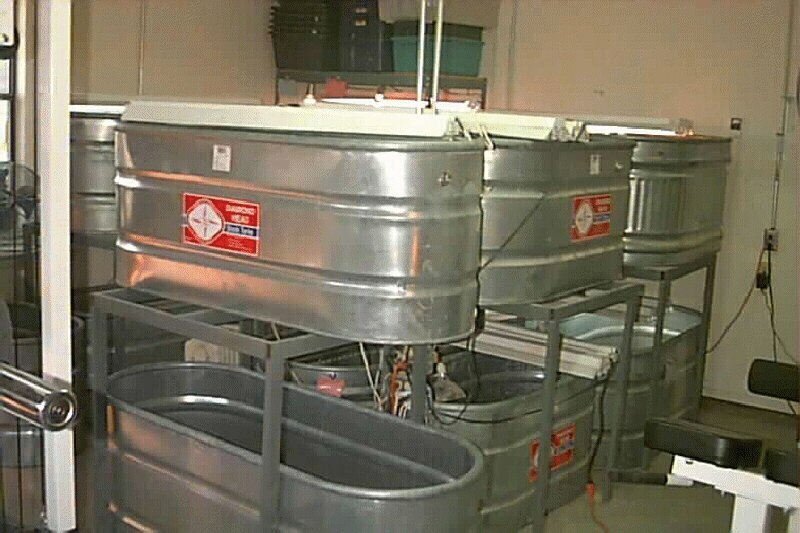 It contains many 50 gallon glass aquariums (Breeder Tanks), A stack of 3 each 4 Ft X 2 Ft wood enclosures with glass front and many 33 gallon Rubbermaid tubs (Not pretty but efficient). 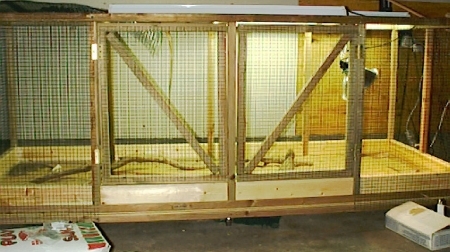 Due to the fact there are so many enclosures in this room, the room temperature stays around 90 degrees. 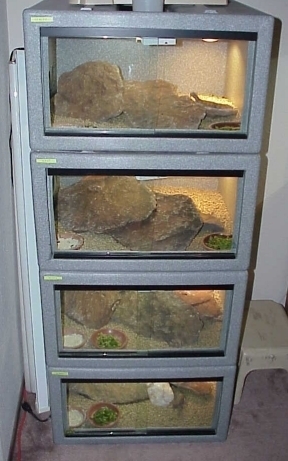 "With such a high room temperature I have none of the problems sometimes reported with glass aquariums and open enclosures." 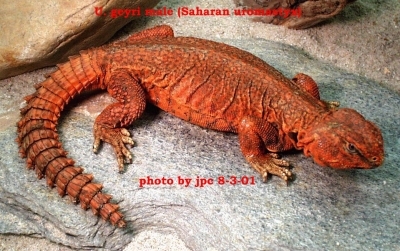 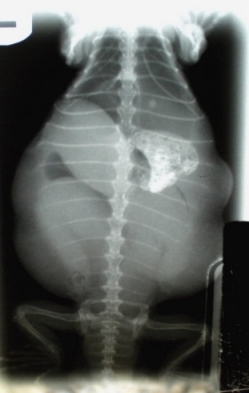 Picture of Uro Room. 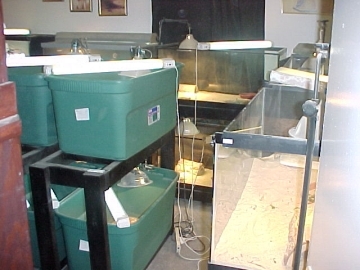 Tank collection setup for baby uros. 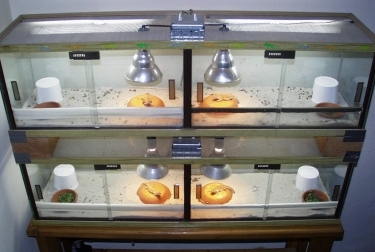 A collection of Mark's enclosures is shown here displaying his setups both internally and externally.